Brave. 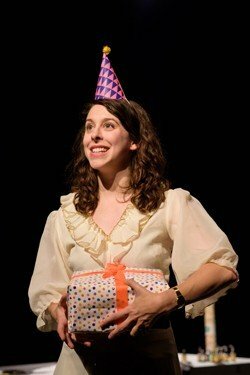 That’s the best word to summon up Surprise!, a one-woman show by Lauren Silver. The show is brave in itself, but Silver as a person is braver for tackling her mental health in such an open way. Using clowning techniques, some delightful props, and a lot of audience interaction (willing or not), Silver takes the audience on a journey that highlights all of her own (real) anxieties, and she faces them head-on. Live. Publicly. It’s really quite impressive, yet there are no elements of showing off. It’s all very real, and rather charming. One in three people have symptoms of mental illness, and today’s society is thankfully becoming more aware of it. This show certainly breaks down some of the mysteries surrounding mental health, as Silver talks exceedingly openly about the ins and outs of her thoughts, and how ridiculous she knows these thoughts are, although she is unable to stop them. Silver is a personable performer, and her engagement with the audience is beautiful. For all the laughs, there are tender moments too, and she does get rather overwhelmed and tearful during some parts. This makes the whole idea even more commendable, as she literally bares her soul onstage, to a room full of strangers. Surprise! is not really a show to go to by yourself, as you may need someone there to share in the laughter and the tension with. Without giving too much away – some of the audience participation is not optional or is randomly selected, and while some people might enjoy that, others might not. The whole, sell-out audience really came together throughout though, and the evening overall was a joy-filled occasion, with that buzz that is sharing emotion with random strangers. If you suffer from anxiety yourself, one may question whether this is the right show to go and see. From a personal point of view – I would say yes. It looks at some of the science behind mental health too, and how parts of your brain are really trying to help you, just perhaps going about it in the wrong way. It also helps realise how irrational some feelings can be, and through laughter, and sharing, Silver overcomes her own fears. Silver also regularly checks in with the audience, so at any point, if an audience member was struggling, it would be perfectly accepted and handled in the right way. That said, it’s not a tense, stressful show at all. There are entertaining moments of tension, but on the whole, it’s all light-hearted, and laughter is a big thing. It’s a shame the run isn’t longer as more people need to see work like this to come to terms with their own struggles in a carefree environment, that normalises the struggles mental health can bring. Surprise! is getting five stars, for Silver’s sheer bravery, brilliance, likeability… and for helping this reviewer see her own anxiety in a different light. Actor, clown and jolly anxious theatre-maker Lauren invites you to a new show packed full of party games and hopefully no panic attacks. SURPRISE! is an interactive clown show that looks at how we can confront anxiety, overcome fear, and find freedom through laughter. SURPRISE! is an authentic and accessible performance that informs and invites us all to an honest and open conversation about managing our mental health in the everyday. By creating a safe space, SURPRISE! is a rare show using clowning and Le Jeu (‘the Game’ a performance concept by renowned master clown and professor of theatre Philippe Gaulier, meaning to find the joy in performance) crafted to be particularly accessible to those affected by ill-Mental Health, promoting positive and supportive dialogue about therapy and self-care whilst celebrating neuro-diversity.